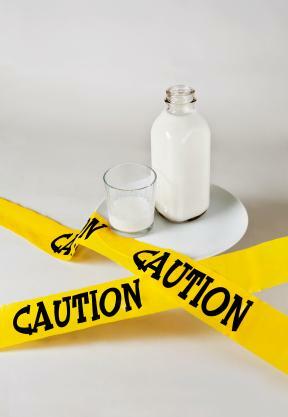 Following a lactose-free diet can help alleviate the uncomfortable symptoms associated with lactose intolerance. Lactose intolerance is a combination of the absence or low level of the enzyme lactase in the digestive system, making dairy products hard to digest. It is not an allergy, so symptoms can be controlled through diet. Because eating a lactose-free diet can result in some nutritional deficiencies, especially calcium, eating a well-rounded diet is important. Try to find foods rich in calcium and vitamin D in order to make up for the lack of milk in the new diet. Can Cats Drink Lactose-Free Milk? Yogurt seems to be tolerated fairly well by most people who are lactose intolerant. This is because the bacteria in yogurt has "pre-digested" the offending lactose and results in easier digestion. Additionally, you should look for calcium enriched items, like orange juice or bread. Some people may be able to tolerate small amounts of milk, more likely when consumed with meals. Certain cheeses contain less lactose. Avoid eating certain things if they irritate the stomach or intestines. While some individuals may be able to eat these foods in small quantities, it is best to try and avoid them if you are lactose intolerant. Staying away from these foods can help stop cramping, diarrhea, nausea, gas/bloating, and other related symptoms of lactose intolerance. If you find it difficult to completely eliminate these foods, try taking a lactose tablet to help aid in digestion. Check labels for soups and other prepared foods. Look for whey, milk by-products, malted milk, and other ways lactose could be included in foods that are not obviously dairy based. Consider taking a calcium supplement along with a daily multi-vitamin in order to be sure you get the daily nutrients you need while on a lactose-free diet. Once you determine a lactose-free diet is the one for you, get a cookbook that caters to lactose intolerant people. Meals.com also has recipes geared toward non-dairy eaters as well. Substituting rice or soy milk may be an option for recipes that call for milk or milk products. Keep in mind that sometimes recipes do not turn out successful due to substitutions though. Cooking vegan (a form of vegetarian that cuts out dairy and dairy byproducts) can also provide lots of recipes for those who are lactose intolerant. Here is a yummy recipe for sugar cookies obtained from Lactose Intolerant. Mix powdered sugar, margarine, vanilla, almond extract, and egg in large bowl. Stir in remaining ingredients except granulated sugar. Cover and refrigerate 4 hours. Preheat oven to 375 degrees. Lightly grease cookie sheet with lactose-free vegetable oil spray. Roll dough about ¼ inch thick and cut into shapes with cookie cutters. Sprinkle with granulated sugar and place on cookie sheet. Refrigerate cookies on a sheet for a few minutes before baking. Bake 7-8 minutes or until edges are golden. Remove from cookie sheet to cool.